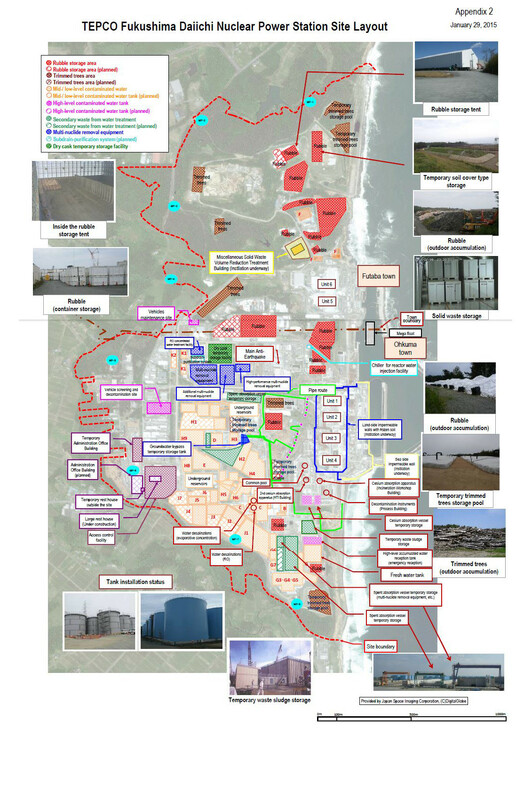 TEPCO has released a detailed map of the various facilities around the plant complex at Fukushima Daiichi. The map is helpful for locating facilities in relation to each other or identifying what something seen in a photo might be. The map below can be clicked on to open a larger version in a new browser tab. There is also an extensive list of the latitude & longitude coordinates for facilities and canals around the plant listed below the map on this page. This can be useful when using Google Earth to identify what is at a location. The measurements and comments are based on comparing that map with a Google Earth image that had been captured on 3/23/2014. 37.415000°, 141.031868° Note: It appears that there are two covered pool tanks. 37.425503°, 141.026137° Note: On 3/23/2014, there appeared to be 50 cask blocks on the pad. Elevation: Approximately 40 m AMSL. 37.416316°, 141.031372° Note: This pad contain three buildings. 37.415622°, 141.031752° Note: Large tank has white sloped sides and brown roof. 37.431247°, 141.030783° Note: This is a large high building that constitutes a major construction project. 37.424467°, 141.024693° Note: A large white building is at this location along with four tanks and two lower units. The site indicator block is not sized properly. 37.424580°, 141.027416° Note: On 3/23/2014, there were two building at this location with a lot of ground clearing going on around them. These structures appeared to have no connections to other facilities. 37.424467°, 141.026500° Note: On 3/23/2014, there was only land clearing going on in this area. 37.425649°, 141.024752° Note: On 3/23/2014, this site only involved the construction of large structure there. 37.425255°, 141.024577° Note: On 3/23/2014, this site only involved the construction of large structure there. 37.414792°, 141.030554° Note: This area includes two long storage pads with rail mounted gantry cranes. On 3/23/2014, the middle pad was filled and the east one was about 80% filled. In total they were about 90% filled. 37.243184°, 141.027057° Note: This is the location of the vessel storage pad with a red, rail mounted gantry crane. It doesn’t appear that something else is planned for this site. Some vessels appear to be stored on the north edge, close to the road. 37.420980°, 141.024579° Note: This contains an array of nine horizontal tanks and two large vertical tanks. The north end of the pad contains other items. 37.415505°, 141.0029915° Note: This storage pad involves the northern-quarter of a long storage pad containing a rail mounted gantry crane. On 3/23/2014, the pad was about 80% full. 37.414604°, 141.029911° Note: On 3/23/2014, about 10% of the lower-three quarters of this rail mounted gantry crane pad was occupied. At the southern end was a collection of fans. 37.417162°, 141.028264° Note: This pad contains over 100 reverse osmosis (RO) cartridges, which will become radioactively contaminated over time. 37.420939°, 141.025314° Note: This appears to be a former parking lot that is used to store a large array of brown containers that likely contain solid materials. 37.419729°, 141.024847° Note: Contains 49 tall gray tanks. 37.413456°, 141.030765° Note: This tank farm contains the following groupings. Forty blue, 24 blue, 17 gray, 17 gray and 6 gray tanks. 37.415022°, 141.029303° Note: On 3/23/2014, this contained an array of 20 gray tanks in a north group and 19 gray tanks in a southern group. 37.414063°, 141.029364° Note: On 3/23/2014, this contained two square pads and a smaller rectangular pad on the south side. They appeared to be covered. 37.421786°, 141.025875° Note: This is an array of 12 tanks. 37.421839°, 141.024386° Note: This is an array of 170 horizontal tanks, in three groups. They are 80, 60 and 30 respectively. This array was present on 3/23/2014, but is shown as planned on the facility location map, released later. 37.420068°, 141.027215° Note: Contains 29 tall gray tanks. 37.420943° 141.026080° Note: This plot contains two large buildings with blue roofs. 37.419530°, 141.028146° Note: This plot contains an array of 36 large tanks and 20 smaller tanks. 37.418489°, 141.026226° Note: This tank farm consist of 31 tanks. 37.418155°, 141.027237° Note: This tank farm consist of 24 tanks. 37.420007°, 141.023756° Note: This tank farm contains 16 tall blue tanks. 37.421122°, 141.023840° Note: These tanks are in two groups. Seven are on the west side and five on the east side. 37.415671°, 141.028244° Note: This contains three pads with tank farms. On 3/23/2014, the bottom pad had 21 tanks with two more under construction. The middle pad had 27 tanks with five more under construction. The upper pad had 3 tanks with two more under construction. It appears to be capable of holding about 34 tanks. 37.416507°, 141.026569° Note: On 3/23/2014, this entire area was being prepared for installing the pads for additional tanks. The area can accommodate approximately 60 tanks like the ones to the SE. Apparently, the northern half of this was to be developed first. 37.416937°, 141.024945° Note: On 3/23/2014, this entire area was being prepared for installing the pads for additional tanks. The area can accommodate approximately 50 tanks like the ones to the SE. Apparently, the northern half of this was to be developed first. 37.416991°, 141.024218° Note: On 3/23/2014, this entire area was being prepared for installing the pads for additional tanks. The area can accommodate approximately 50 tanks like the ones to the SE. Apparently, the eastern 60% of this was to be developed first. 37.417583°, 141.024447 Note: On 3/23/2014, this entire area was being prepared for installing the pads for additional tanks. The area can accommodate approximately 40 tanks like the ones to the SE. 37.418040°, 141.025119° On 3/23/2014, this entire area was a parking lot. The area can accommodate approximately 50 tanks like the ones to the SE. Apparently, the eastern 40% was to be developed first. 37.417752°, 141.023098 Note: On 3/23/2014, this entire area primarily contained trees. It had not undergone development. The area can accommodate approximately 40 tanks like the ones to the SE. 37.425377°, 141.023980° Note: On 3/23/2014, no tank was visible here. 37.424604°, 141.023946° Note: On 3/23/2014, no tank was visible here. 37.424611°, 141.023670° Note: A lengthy building appears at this location. The map marker block appears to be placed a bit too far north of the center of the building. 37.422485°, 141.024723° Note: There are three reservoirs in this area covered by gray roofs. 37.436551°, 141.032092° Note: A drainage ditch runs N-S along the east side. Two storage cells appear to be completed on the west side. A northeast cell appears to be under construction. It appears to have a rebar covering and that may be followed with concrete and perhaps soil. It appears that a fourth cell has yet to be created. 37.436250°, 141.030294° Note: There are two white-roofed buildings here. 37.434922°, 141.030719° Note: This contains 11 uncovered storage cells. Some of the cells appear to contain white bags. Two of the cells on the west side appear to contain fan housings. What appears to be two large pump motors appears at 37.435060°, 141.030476°. 37.433548°, 141.030801° Note: Two tent building are present with other rubble on their south side that is covered under white tarps. Other materials are on the east side of the buildings. 37.433408°, 141.032866° Note: In this earlier satellite view this area was not cleared for rubble storage. 37.431957°, 141.031735° Note: Rubble is on both sides of the road under white tarps. 37.432073°, 141.030236° Note: Various sizes of waste boxes are stacked on this pad. Some materials, on the southern downslope, appears to be quite old. 37.427032°, 141.028218° Note: This involves six buildings. 37.426568°, 141.032654° Note: This contains two large buildings. 37.425907°, 141.032477° Note: This appears to be a storage yard for damaged and contaminated, small to medium sized, vehicles. 37.425305°, 141.032141° Note: On 3/23/2014, this pad was empty. 37.424725°, 141.032206° Note: This area contains a large stack of white waste boxes. 37.422074°, 141.029303° Note: A couple of fans are visible in the rubble pile on the right. A collection of waste containers are on the south side. 37.414065°, 141.031962° Note: On 3/23/2014, there was little visual evidence of rubble at this plot. Just to the east of it there are a lot of large stored mobile machinery that might be contaminated. 37.416523°, 141.029561° Note: On 3/23/2014, earth, or clay fill was being applied to this area. To the E-SE of it was another plot that contained rubble and white waste boxes. 37.417062°, 141.029959° Note: This pad is filled with rubble, on 3/23/2014, that isn’t marked on the later map. 37.418496°, 141.029561° Note: This pad is filled with rubble, on 3/23/2014, that isn’t marked on the later map. 37.436250°, 141.030294° Note: White waste containers appear to be stacked here. No building covers them. 37.426912°, 141.026461° Note: This area may be destined to be cleared out of existing trash. It contains a couple of buildings at its north end. 37.418876°, 141.029446° Note: On 3/23/2014, this area appeared to be well cleared of rubble. Some seemed to be present NE of the block shown on the map. 37.434871°, 141.024315° Trimmed trees. Note: Log storage. 37.432482°, 141.025596° Trimmed trees. Note: Log storage. It appears a chipper is at this site. At the north-east corner of it are two silver tanks. Those may hold a chemical needed to digest the wood chips when they are in the storage pools. 37.423020°, 141.029271° Note: On 3/23/2014, there appeared to be large piles of forest debris. There is little evidence of logs, as at other sites. 37.438667°, 141.033529° Note: This contains seven cells. All appear to be completed with a white cloth covering. 37.437143°, 141.033770° Note: This contains 16 cells. Five appear completed with white cloth covering. The rest appear to have rainwater at the bottoms. Some have one, or more, slanted sides. 37,421791°, 141.026564° Note: There is no visual evidence of ’Temporary’ trimmed tree storage pools here, or of any tree debris on 3/23/2014. 37.419322°, 141.029383° Note: There is no visual evidence that such pools have existed here. 37.412376°, 141.032232° Note: There are 23 storage pools in this array with ten of them being covered on 3/23/2014. 37.427195°, 141.023948° Note: On 3/23/2014, it may not have been performing this function. A western portion appeared to contain bins holding various materials. 37.420990°, 141.026952° Note: This contains 20 tall tanks. 37.420400°, 141.020400° Note: On 3/23/2014, the foundation for a large building was being constructed here. 37.418571°, 141.020617° Note: On 3/23/2014, there were three buildings at the lower portion of this block. 37.418959°, 141.021922° Note: On 3/23/2014 the former parking lot was being cleared to begin construction of the large building. The temporary rest house was indicated as being just attached to the west wall of it. 37.418565°, 141.021565 Note: This appears to consist of at least three large structures. 37.424896°, 141.029757° Note: Poor label (Function-?). * Compiled by Vernon Brechin on 1 March 2015.